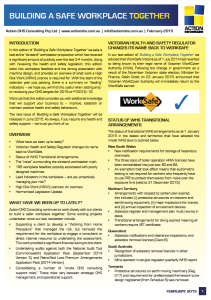 Please find Action OHS Consulting’s February 2015 edition of our 4-monthly newsletter Building a Safe Workplace Together. In this edition we take a look at your role as a safety professional in managing the current “sit-stand workstation” phenomenon. In addition to this, we have investigated ways to support you manage potentially fatal machinery, looked to assist you establish health and safety performance indicators, and provided an overview of what work requires a High Risk Work (HRW) Licence. To stay up to date with topical health and safety news and events please “Connect” with us on LinkedIn, for find us on Facebook or Twitter. If you would like to be placed on our future mailing list please contact us.